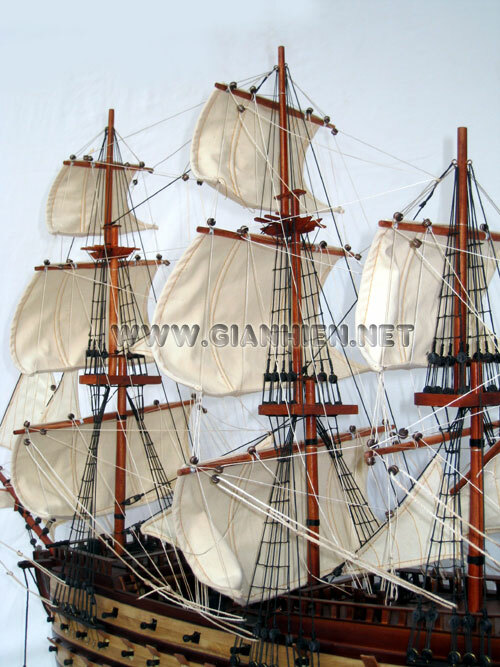 Model is hand-crafted form wood with planks on frame construction and the hull is meticulous built with small plates of wood. Model is full assembled and ready for display. 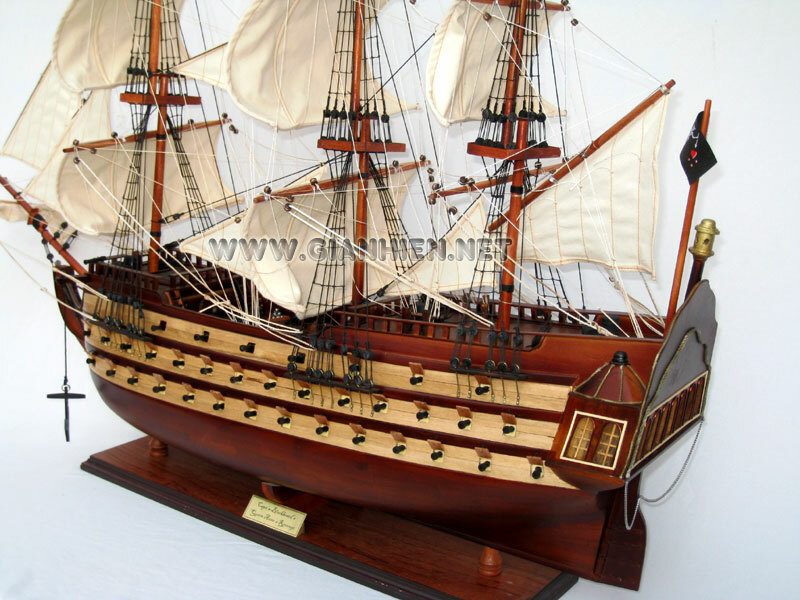 Queen Anne's Revenge was the name of English pirate Blackbeard's flagship, used by him for less than a year but an effective tool in his prize taking. 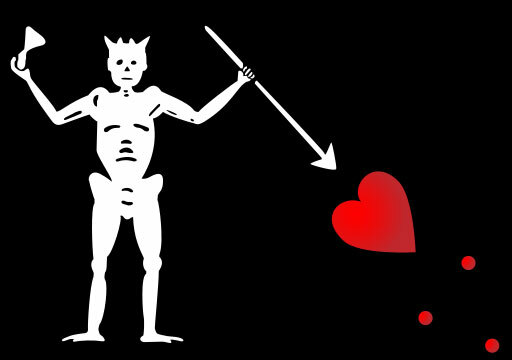 Blackbeard was said to have gone aground in 1718 in the ship in Beaufort Inlet, Carteret County, North Carolina. 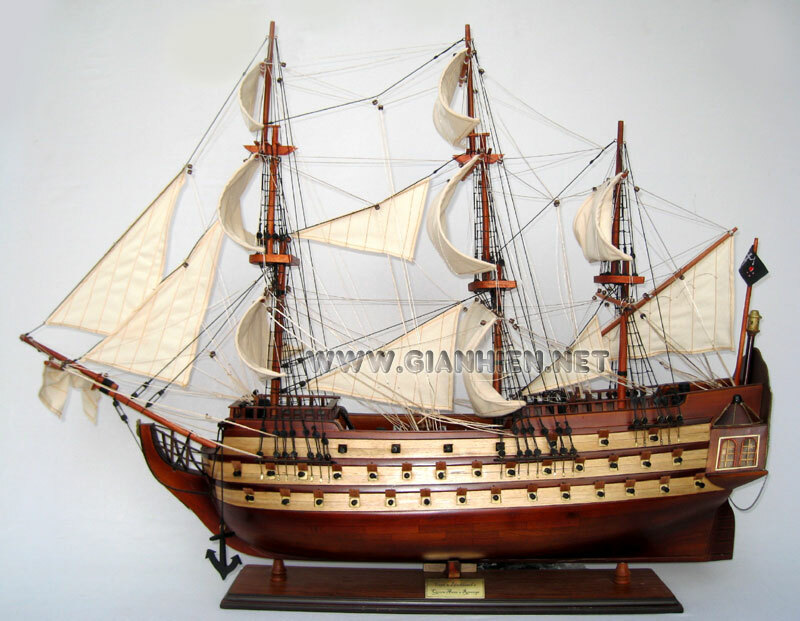 In late 1996, Intersal, the private contractor working for the state of North Carolina in marine recovery, discovered the remains of a vessel that people believe is likely to be Queen Anne's Revenge. 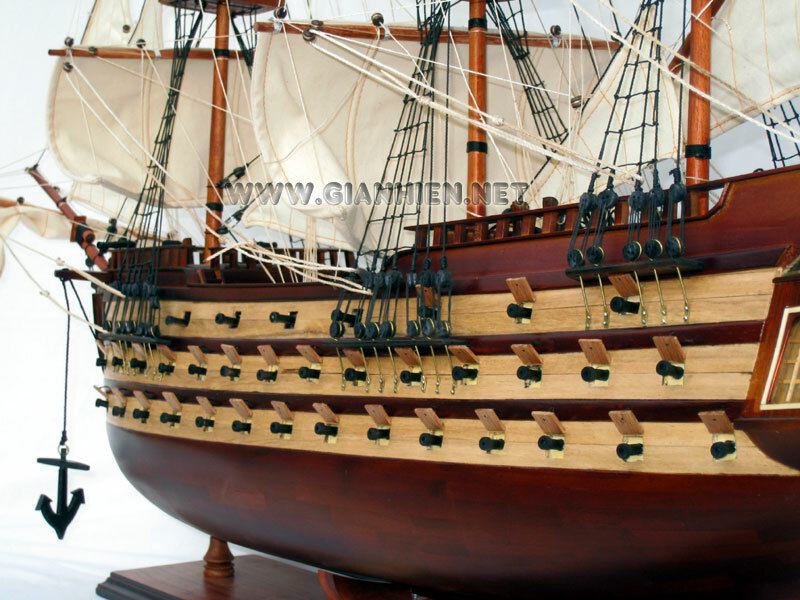 The 3,000-ton vessel, originally named Concord, was a french-man-of-war built in the Kingdom of Great Britain in 1710. She was captured by the French a year later. 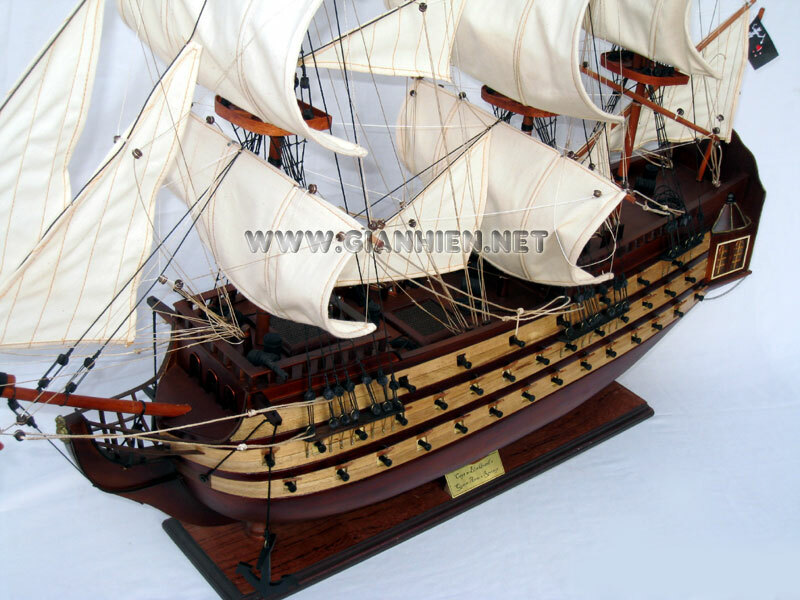 The ship was modified to hold more cargo, including slaves, and renamed La Concorde de Nantes. The slave ship was captured again by the pirate Captain Benjamin Hornigold on November 28, 1717 near the island of Martinique. Hornigold turned the ship over to one of his pirates�Edward Teach, who was later known as Blackbeard�and made him captain. His first mate, Christopher Blackwood (known as Blackbeard's Claw) was feared as a ferocious combatant and led many of Blackbeard's boarding parties. 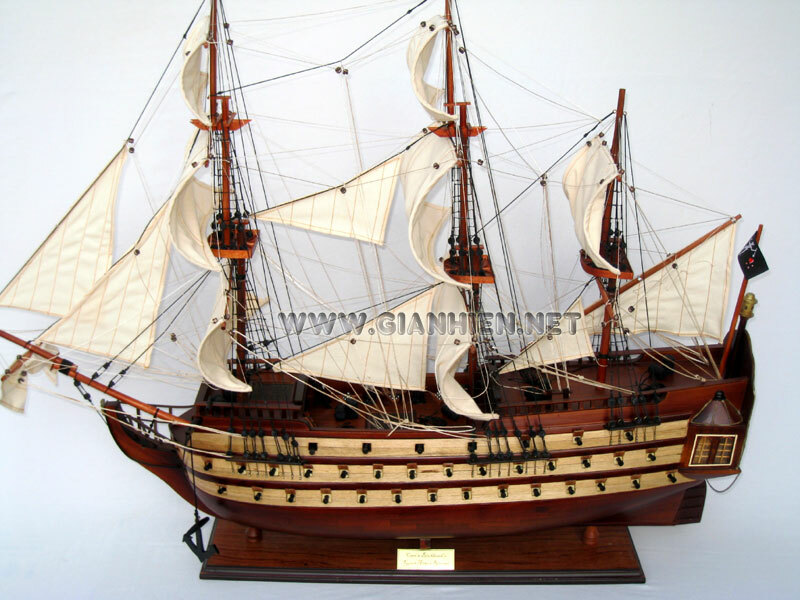 Blackbeard converted La Concorde into his flagship, probably adding guns and renaming her Queen Anne's Revenge. The name may have come from the War of the Spanish Succession, known in the Americas as Queen Anne's War and one in which Blackbeard had fought, or possibly named it after Anne in sympathy to the Stuart claim to the British throne. Blackbeard ranged with this ship from the west coast of Africa to the Caribbean, attacking British, Dutch and Portuguese ships along the way. Shortly after blockading Charleston harbor (May 1718) and refusing to accept the Governor's pardon, Blackbeard ran Queen Anne's Revenge aground while attempting to enter Beaufort Inlet, North Carolina. Blackbeard disbanded his flotilla and escaped by transferring supplies onto the smaller ship Adventure. The pirate captain abandoned several crew members on a small island nearby. They were later rescued by Captain Stede Bonnet. Some sources suggest that Blackbeard deliberately grounded the ships as an excuse to disperse the crew. Shortly afterward, he surrendered and accepted a royal pardon for his remaining crew and himself from Governor Charles Eden at Bath, North Carolina. Intersal Inc., a private research firm, discovered the site believed to be "Queen Anne�s Revenge" on November 21, 1996. QAR was located by Intersal�s director of operations, Mike Daniel, who used historical research provided by Intersal�s president, Phil Masters. The location of the vessel is in the Atlantic Ocean in shallow water offshore from Fort Macon State Park, Atlantic Beach, North Carolina. Several of the guns and more than 16,000 artifacts have been recovered from the wreckage; however, none of them appears to be of French origin (as would be expected from a French slave ship). They are mostly of British origin (as would be expected with a colonial pirate crew). For one week in 2000 and 2001, live underwater video of the project was uploaded to the internet as a part of the DiveLive educational program that reached thousands of children around the world. This project enabled students to talk to scientists and learn about methods and technologies utilized by the Archaeology team. Project Director Mark Wilde-Ramsing of the North Carolina Underwater Archaeology Branch supervised recovery of artifacts from the site through the 2007 field season. In November 2006 and 2007, more artifacts were discovered at the site and brought to the surface. 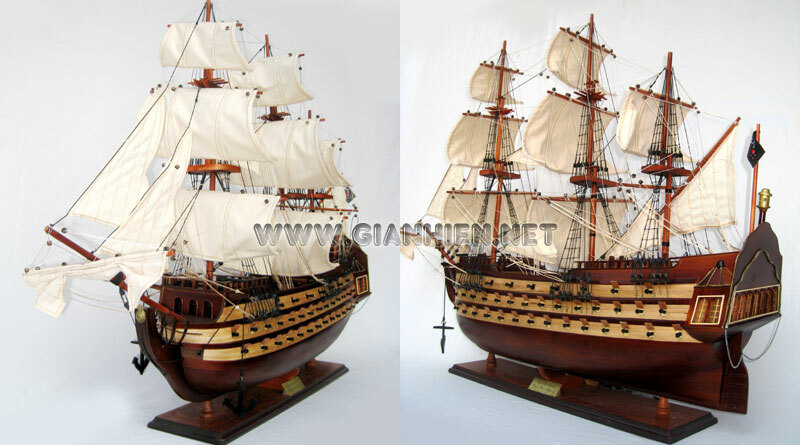 The additional artifacts appear to support the claim that the wreck is that of Queen Anne's Revenge. Among current evidence to support this theory is that the cannon were found loaded. In addition, there were more cannon than would be expected for a ship of this size, the cannon being of different makes. Depth markings on the part of the stern being recovered point to have been made according to the French (and not English) foot measurement. By the end of 2007, approximately 1/3 of the wreck was fully excavated. Artifacts are undergoing conservation. The North Carolina Department of Cultural Resources set up the website Queen Anne's Revenge to build on intense public interest in the finds.